Vaccon Air Amplifiers easily and safely handle porous objects that many consider too challenging to handle with vacuum. 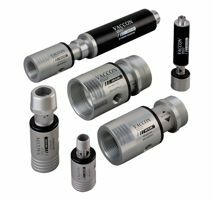 Vaccon air amplifiers are field-adjustable to meet your process or product specifications. With its inline, straight through design – dirt and debris pass right through, there’s no clogging, no downtime. The CDF Series vacuum pump efficiently generates a high vacuum flow and a high exhaust flow using a small amount of compressed air, with amplification ratios up to 40:1 (output to input). CDF's are ideal for applications that require high levels of flow such as the rapid evacuation of fumes, blow drying wet materials, or to cool hot areas and/or materials. CDF Series air amplifiers generate high vacuum flow, overcoming leaks inherent in handling porous objects such as cardboard, foam or fabric. CDF air amplifiers safely transfer irregularly shaped items, with or without a vacuum cup. Rigid cups, for use with the CDF Series are available specialty materials such as UHMW polyethylene, Teflon® and Delrin®. For chemical compatibility, heat and environmental requirements, food and medical applications, custom materials are available: stainless steel, Delrin®, Teflon®, PVC, and more. A solenoid valve may be incorporated for instant on/off control so that CDF’s operate only when air is needed. Need a crossover for a competitor's product? Call Vaccon for help in choosing an equivalent model. For chemical compatibility, heat and environmental requirements, food and medical applications, custom materials are available: stainless steel, Delrin®, Teflon™, PVC, and more. Consult factory. Dimensional data for the CDF Series Air Amplifier / Blower Pump is presented in 2D drawings, with all critical dimensions and port thread sizes displayed. Both imperial and metric units are included. Performance data for the CDF Series Air Amplifier / Blower Pump is displayed, listing air consumption, vacuum flow at various vacuum levels, and noise levels. Data is presented in tabular and graphed formats, in both imperial and metric units. Vaccon’s CDF Series Variable Vacuum / Variable Flow pumps are available in custom materials, sizes, shapes and connections to suit specific requirements or manufacturing environments, such as food processing, semiconductor or pharmaceutical manufacturing. Vaccon CDF Series pumps are available in brass, stainless steel (303, 304, 316, 316L), PVC, Teflon™, PEEK and Delrin® (Acetal). Please consult the factory.